Lady of Geonosis, Ang de Geo and the one and only Security Chief Alat�ri�l Pallan�n made her way into the Traxion prison complex. To her right, walked Ryan Davad, a man that rarely parted her side. To her left, walked a cuffed politician hailing of Manaan. A recent capture by the Lady herself, and a nice prize to show the galaxy. Terrorists have very little rights. As the Thanagarian pounded down the hallway, her heels clicking with each step, the Geonosians hissed at the Manaan native while bowing to their legendary leader. The long and awaited return of the great Alat�ri�l Pallan�n had come. The scum that walked behind her would certainly pay for the crimes he committed. Tavion Star, until that fate came, would live in this prison. Sadly, he would be one of the better off prisoners versus the lower-decks. Kriekas greeted the Lady of Geonosis, he had left Coruscant a week before herself, and bowed upon the angel's appearance. The creature saluted to Ryan Davad, then saw Tavion and resisted the urge to smack him. Kriekas, as if sensing the next figure's approached cowered away. It was his own personal fear that made him do so, versus the individual. Geonosian Dark Knight Moriquendi appeared at the long hallway, cloaked in his black robes. 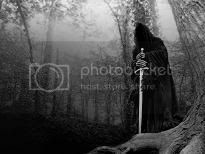 An eerie sword existed in his hands as he made his way towards Tavion. The creature twirled it in his hands, then stopped suddenly in front of the group. It dropped to a knee, and bowed its head to the Lady of Geonosis. "Lord Moriquendi," her angelic voice pierced the fear he had created, "Take us to Star's new home." The Dark Lord rose to his feet while taking a step towards the individual. Fear stroked everyone nearby, chilling all to their centers'. As the caped man turned and walked towards the high security chambers, the group continued forth.